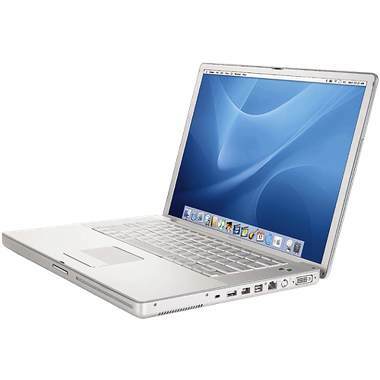 I’ve been using a PowerBook G4 at work, along with the Toshiba tablet that is required for each teacher, for several years. I still like it and use it a lot. There are certain network PC-specific things I have to use the Toshiba for, like the way Outlook is set up, but for an awful lot of stuff I can still use the PB. Last year I upgraded it to 2 GB of memory. Today I replaced the 80 GB hard disk with a 120 GB version. Why only 120 GB? Because that was what our tech guys had lying around unused. Since it’s an ATA drive there is not much use for them at school any more. I would have liked a 160 GB drive, but this one was free, so that’s what I used. I had to go to Micro Center to get a Torx-6 screwdriver for two screws – just two – on the top of the keyboard. I used a repair manual from powerbookmedic.com to open it up successfully. This was more involved than replacing the drive in my old G3 WallStreet back in the day. Watch out for the little clips behind the front of the DVD drive – they are very easily bent. I used Carbon Copy Cloner and a firewire enclosure from New World Computing to copy my entire drive to the new drive first. (I had the enclosure from a few years ago, with an old 40 GB drive in it – I think it was from the WallStreet.) Then, once the ‘book was opened up, it was a simple thing to swap drives. All in all, a successful swap. You’ll need that Torx-6, and a couple of small screwdrivers (the smallest one I needed I bought in a $ 1.99 set while at Micro Center; it’s a #1). Tweezers help a lot to grab those tiny screws to remove and replace them. Now I’m considering installing Leopard on this machine. I’m a bit nervous about doing it, figuring a pretty big performance hit on a machine with a single 1.25 GHz G4. It works OK on my iMac, but that’s a 1.8 GHz G5. Comments on the web have been inconclusive at best. Anybody know if this is a bad idea? You are currently browsing the The Old Gray Cat blog archives for the day Thursday, August 14th, 2008.